Review: I’ve been a fan of Lovecraftian horror for some time. 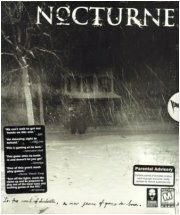 That’s why back in the late 90s, I was excited to hear about Nocturne, a survival horror game that utilized some similar themes. In the game, you control an abrasive, anti-social monster hunter named The Stranger. Working for the fictitious government agency, Spookhouse, it’s your job to make sure the world is kept safe from monsters. And what’s the best way to do that? By killing them all, of course. Granted, doing so still requires you to work with a few of the friendly monsters, but The Stranger is professional enough that he can put up with them, despite his intense hatred of monsters. Monsters and showing any kind of emotion. The actual missions you’ll be tackling are divided into four standalone episodes, each with a unique feel to it. In each, you’ll clash with classic movie monsters like werewolves, vampires, zombies, and even servants of some obscure elder god. Seems like a fairly straightforward way to trash some monsters and maybe have a few scares along the way. Unfortunately, getting a lot of genuine scares out of the gamer while still having a game interesting enough to carry them from scare to scare is harder than it seems. For starters, the game uses cutting-edge (for the time) shadows both for puzzles and for atmosphere itself. Plus, The Stranger comes with a flashlight that can be used to light up the prerendered environments in ways never before seen in a survival horror game. This is where the problem shows up: your flashlight battery can only run for around 15 seconds before it needs to be recharged. Add to that the fact that you can’t adjust the brightness in the game at all, and you’ve got yourself a dark mess. The Stranger actually has a pair of first generation night vision goggles that actually put the environment in a black-and-white first person perspective, but since you can’t do anything but move while you’re using them, they don’t really see a whole lot of use in the game. And seeing what’s going on is troublesome enough in these early survival horror games where the camera remains in a fixed position, leaving you to fend for yourself if an enemy just happens to grab you right at the edge of a scene. It’s even more important in Nocturne, however, because there are a number of environmental hazards that, if approached carelessly, can instantly kill The Stranger. Speaking of which, that is another way that Nocturne separates itself from other games in the genre: your character can jump and fall. Especially fall. The game is loaded with hidden pitfalls. In particular, I remember a time in the first episode where, while walking through a werewolf-infested forest, I came across a field filled with pit traps cleverly disguised as shades of grey that were just as dark as regular shadows. Well, “came across” is a roundabout way of saying “fell into”. Repeatedly (thank you so much, jump cuts). And then there’s jumping itself. The Stranger can get some good air with his jumping, but amazingly, his bones seem to be made of balsa wood. A fall from a height of around 6 feet will severely damage The Stranger, and a fall from much further than that will kill him outright. Plus, there are scads of jumping puzzles in the game. Jumping puzzles! In a survival horror game! The horror is definitely there, but the survival is sorely lacking. The other big problem with the game is the scare factor. For a game in the survival horror genre, there really aren’t that many scares to be found. The fourth episode, “The House on the Edge of Hell”, does the best at inflicting scares on the player by having death around every corner, and not necessarily death from something stupid like accidentally walking off a platform because the camera angle only shows the platform in profile. The scary atmosphere the game tries to set up is further sabotaged by the unnaturally stiff animations, and even the music. The game’s music may sound a bit familiar to you, and for good reason: it’s all public domain stuff. You may have heard some of the scary orchestra music in a commercial for some Halloween-themed event, or played ironically for some minor event in a movie on Comedy Central. Sometimes, the music works in the game to further the atmosphere, but most of the time, you’ll likely find yourself bored of hearing the same tired themes over and over again. The game does have its good qualities, but they are outshone by the game’s flaws. Darkness can be good, but too much darkness can be annoying, especially when you’re trying to negotiate your way around environmental hazards that are hard enough to see when the scene is fully lit. Likewise, having music written for your game rather than picking up whatever free music you can find will make it easier to tailor music to the situation. Without giving too much away, the game ends with a cliffhanger, which seems like a pretty cocky move on the part of the developers, given the various unresolved problems the game has. Jumping in a survival horror game could be implemented very well (think T-rex in Jurassic park, except this time you don't have a jeep). Jumping puzzles, you say? Puzzles in this genre are enough, there's no need to put jumping into the equation. Unless they were fun jumps. For some reason your description reminds me of Shadowman, that N64 and then later Dreamcast action RPG where you regularly travel to the underworld to kill a rising demonic power (legion), lead by The Man with a Mouth of Blood. I love this game, even though (or maybe even because) it´s poorly done for the most part. Love the cheesy story and the Stranger. AND he was in the first blairwitch-game wich was REALLY good in my opinion. Falling damage is one of the more realistic features I think a game can have, but a measly fall from six feet doing that much damage? Heard of this game a while back. I'm not surprised that it only got a 3/5 pickle rating. Interesting side note on what Mister Tea was saying: the Castle Gaustadt level in Bloodrayne is pretty much the same as it was in Nocturne, except that you move through it a lot faster because you're not a puss with brittle ankles. The downside is that you have to play through most of Bloodrayne to see the level.